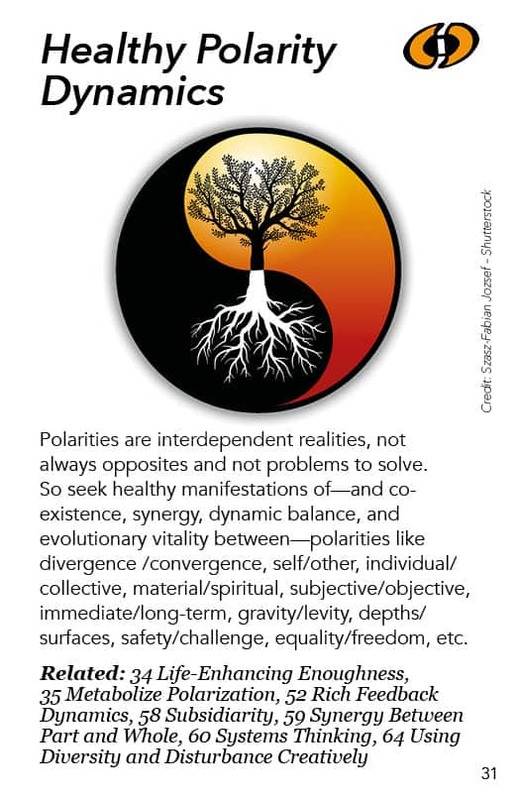 Polarities are interdependent realities, not problems to solve. So seek healthy manifestations of—and co-existence, synergy, dynamic balance, and evolutionary vitality between—polarities like divergence /convergence, self / other, individual / collective, material / spiritual, subjective / objective, immediate / long-term, gravity / levity, depths / surfaces, safety / challenge, equality / freedom, etc. We are dealing here with a reality of life. Efforts to suppress one part of a polarity will only evoke counter-energies from the part that was suppressed. So it’s not a matter of being able to totally do one of them and not the other. You have to take both into account if you want to be wise, if you want to be sustainable, if you want to avoid a lot of problems. So part of being a wise society or a wise democracy is recognizing when the dissonance that you’re being faced with is not a problem to solve but a polarity to relate to and manage. So in this pattern I list a whole pile of different polarities. I can talk a bit about each of them but we’re looking for some kind of balance or coexistence or synergy between these different different things rather than supporting one of them at the expense of the other. Divergence-convergence is a very hot polarity. There are processes which create divergence. When you ask open-ended questions suddenly everybody’s different perspectives show up. If you have a conversation based on an open-ended question like “What is art?”, everybody is saying what they think art is and people suddenly go, “Whoa! Come on! Some of these people are ridiculous and some of these people are geniuses. But what are we even talking about here?” Suddenly there is all this disturbance and dissonance. Then there are processes to help create convergence. The name “consensus” all by itself helps you think in terms of convergence. Voting in a system where people respect the results of the vote is a convergent process. Dynamic facilitation has an interesting dynamic whereby it is supporting a convergence that isn’t so much coming together from different places as emerging out of some previously hidden common ground. Yet even that can be considered convergent, in the sense of people coming together. Most productive conversations have early divergent dynamics as a topic is explored and then some later convergent dynamics to help people come together. Likewise, healthy societies have dynamics that support both diversity (divergence) and unity (convergence). Self and other, that’s obvious. We all wrestle with that polarity. I want this and they want that, or we are better than they are, or I am a separate being from the rest of the world. There is the Other and anything that is outside of the self is the Other. One of the ongoing challenges of life is how do you relate to the Other and keep a balance with yourself. You have to serve yourself and you have to serve the Other, you have to show compassion for yourself and for the Other. How do you navigate in the dynamic tension between these? How do you learn, how do you bring forth what you have to say to another person and how do you bring forth what they have to say? There’s some potential learning and wisdom to get from doing all that well. That would be an example of evolutionary vitality, not just coexistence, but actually serving the healthy development of each other. Individual-collective: Individual rights versus collective well-being: Is there a way to create synergy between those? Can we create systems where individuals can serve the community by being who they most essentially are? Can there be a culture which supports individuals in being who they most effectively and deeply are? There is synergy where you can do things together that you couldn’t do if you didn’t have the community, and where the community can do things it couldn’t do without strong individuals. Mutual respect and support work both ways. It’s not primarily a matter of defending the individual from the collective that it is going to oppress them, or the collective has to defend itself because problematic individuals are going to disrupt it. Although these are necessary aspects of a whole situation, they are seldom worth the exclusive attention they get. We’re looking for more creative and wholesome ways to treat polarities. Material-spiritual: Does science or spirituality have the real answers to human life? Well the fact is there are limits to how far material reality can go in creating long-term benefits. To the extent you are a materialist, you are trying to be values-free. You try to just describe “what is” but “what is” doesn’t tell you what you want. “What is” doesn’t tell you what should be. Spiritual awareness, a deep understanding of our connectedness and where our life energy comes from, is really important for directing us. But we need to have materialist science help us understand what is, so that our spiritual longings can be served in ways that make sense in terms of the way the universe is organized. Some of the materialist science and technologies that are being developed are potentially disastrous. Spiritual based ethical principles can help us moderate the dangers of that. Subjective-objective: Is what I see really what is? Is there some outside objectivity that is more real and important than what I experience? There are senses in which both of those questions are meaningful. But there are problems with using objective reality to dominate what somebody sees and believes and thinks: They will resist that or much of their life energy will be suppressed and you will degrade them. I remember having a picture that I drew when I was a kid analyzed by my father in detail and critiqued. I didn’t do much art after that. This is the (supposedly) objective dominating the subjective. The subjective dominating the objective is likewise problematic: “What I believe is what is, and you can’t tell me otherwise!” There is a psychological dynamic called “confirmation bias” whereby we only take in information that supports what we already believe. Most of us have that in one way or another. That is giving preference to the subjective over the objective. The fact is that what most of us think of as “objective reality” is to an odd extent constructed by the interactions of subjective entities – a phenomenon that sometimes goes by the name of intersubjectivity. We can support a balance by respecting and letting the objective and subjective realms inform and augment each other. Both of those perspectives have gifts to give to our broader understanding and engagement. Immediate-long-term: The is an old one. It is like if you want to be an adult, you have to set aside immediate gratification. But if you’re only thinking in terms of long-term, your life may become very dry and drab because everything is a sacrifice for the future. So there’s a dance. How do we satisfy, as the original sustainability definition says, the needs of current generations without undermining the capacity of future generations to meet their needs? Beyond that, how might we satisfy long-term needs in ways that actually serve us now? It’s like how do we balance the need to be healthy by eating a healthy diet with our immediate urges to reach for all the unhealthy junk food? There’s an approach to dieting that says to just pay attention to what you’re eating, don’t get into a big deal about how much or which things you are eating. Just pay really full attention and that deepens your immediate experience and you tend to eat better food and less because every moment of eating is so deeply rich and satisfying and you are so in touch with how your body and mind are responding to the food. This is an example of a synergy between immediate and long-term. In all these examples, we can benefit by consciously exploring how these things that seem so different could actually be synergized, and not just coexist or be balanced, as desirable as those states are, as well. The fact that both of sides of a polarity are generating their influence is usually a highly desirable thing. We wouldn’t want to have just one of them. Depths and surfaces: This is related to the gravity-levity dichotomy. The depth half is like delving into the depths of what’s going on, what’s important, who we are. You can go on forever and never actually find something that applies to real life. Real life is lived so much on the surfaces. Therefore, pay attention to the surface manifestations of things while informing them with in-depth understandings. Also recognize when you’re going into the depths that you want stay related to the surfaces. It’s almost like a diver with their tube going to the surface to give them more oxygen to be able to breathe. So depth and surface is another one of the polarities where you really can’t have either one all by itself in a healthy way. Safety and challenge: A whole pattern Safety First and Then Challenge is concerned with that. People will not be able to bring their life energy to the challenge if they don’t have some sense of safety. Sometimes that sense of safety is not objective; it is purely subjective. If a person has the sense that you cannot kill their spiritual being, you cannot kill their spirit, you can only kill their body, they have a lot of power and intrinsic safety. People who have that perspective and who are therefore not afraid of anything are so much more ready to take on the challenge which is part of the spiritual basis of powerful nonviolent movements like Gandhi and King led. You can beat me, you can jail me, but you can’t harm my spirit unless I let you. To just seek safety, however, means you’ll never meet any challenges and that is a problem in terms of real life because life will end up challenging you. If you seek challenges with no safety you will be wiped out pretty soon. If you don’t attend to your safety at all and continually climb up mountains with no safety line, your life span will be fairly short. That’s another synergy and they can feed each other. Providing a safe space for people can help them take on real challenges. So we are mindful to take people beyond their comfort zones but not so far that they shut down or destroy themselves. Equality-freedom is an interesting dynamic. I didn’t even think of those as opposites but they were given to me as an example of polarities in a workshop. The workshop leader observed that if you want a society that is very equal, you have to clamp down on some freedoms. If you give people full freedom, the resulting positive feedback loops will magnify their diversity and generate inequality. The person who is more capable is going to become more capable in a totally free environment and is going to accumulate more reputation and more wealth or power. The more that happens, the more there’s going to be a response, “Ok, now we’re going too far and we’d better stamp down on that.” But if you end up trying to push equality too far, people are going to start to resist the limits on their freedoms that go along with that. So is there a way to have equality of opportunity and freedom up to a certain point – and to recognize that certain kinds of freedom are actually empowered by operating within constraints? Think of the artist who has his medium to work within: what kind of creativity and freedom can be expressed within the limits of that medium? So there are ways to have freedom and not encroach on others and there are ways to have equality of opportunity and not encroach on anybody’s freedom. Again it is about trying to balance these and explore synergies. Polarity Management, a lot of the insights that I had on this came from a field specifically called “Polarity Management”. The workshop I attended on that had equality and freedom as their examples. They note that as you push and try to maximize any one side, energies come up from the other side to counter that. Instead of allowing the feedback loop to manifest as an extreme crashing back and forth, you can manage it to be a quieter synergy-seeking kind of dance between the polarities. The Yin-Yang symbol from Taoism: The image of these two little fish dancing head to tail suggests that there is an interdependent dance between opposites. Beyond that, there is also interbeing, or mutual definition and manifestation – each necessary to the very existence of the other – that is implied by the eyes of the little fish in the yin-yang, each the color of the opposite fish. Within equality we can find freedom and within freedom we can find equality and there is a surface dance between them while in the heart of each one, black and white, we find they define each other. White doesn’t exist without black, and black doesn’t exist without white. 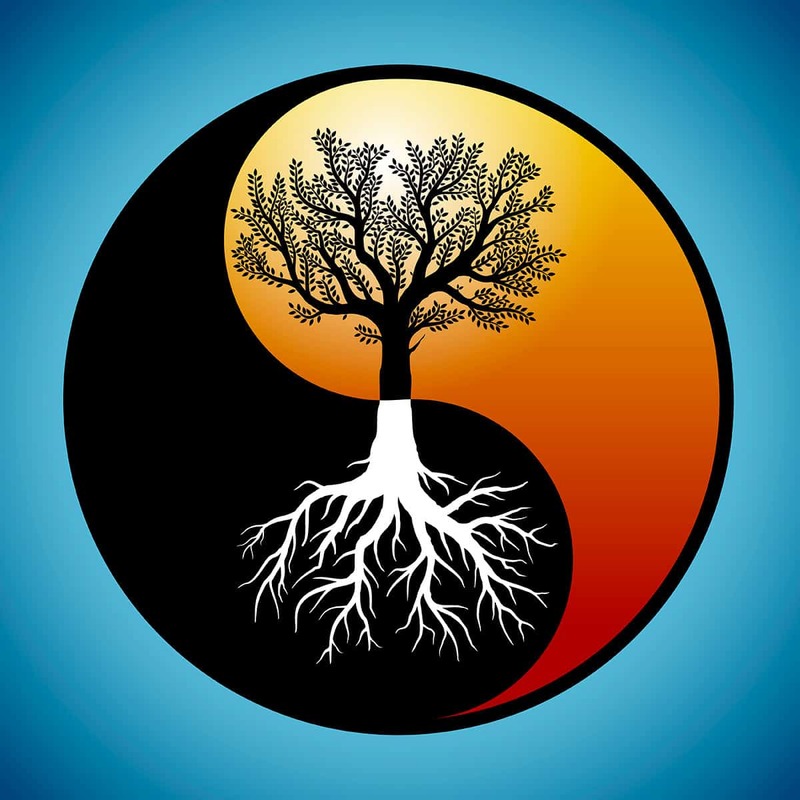 That’s a deep lesson from Taoism: Recognizing that intrinsic dance and being able to consciously play in it as a partner is one of the things Taoism is trying to invite us into. Dialectic: Hegel’s dialectic is often associated with Marxism as one of its inspirations, because the official name of Marxism is dialectical materialism. But the dialectic simply talks about what happens when you have two very different beliefs about the world. Somebody comes up with some statement claiming “This is the way things are!” and then somebody comes up with a counter-statement that says, “No, that’s not the way things are! This is the way things are.” There is a dynamic tension created between these claims that dialectic theory calls a thesis and its antithesis. Out of that tension comes a synthesis – a new integration of the two – either with tremendous violence and suffering or through conscious understanding and deepening. The Dialectic sees this dance of opposites going on and notes that the synthesis that comes up constitutes a next evolutionary phase. It becomes a new thesis and something else emerges to become its antithesis and the interactions between those generate the next synthesis. It goes on forever; there is no arrival there. Science and religion dialogues: I was part of an Open Space conference that included a dozen evolutionary scientists, a dozen evolutionary spiritual people and a dozen evolutionary activists. It was one of the most intriguing five-day long conferences I ever participated in. There are many science and religion meetings trying to put those two things together. People are beginning to sense that each of these great human enterprises have important gifts which so often are unfortunately framed as opposing forces in society. One of the many efforts to develop a profoundly meaningful science-based religion is Michael Dowd and Connie Barlow’s “evolutionary evangelism” which can be explored at http://thankgodforevolution.com. Ken Wilber: Philosopher Ken Wilber has developed a whole world he calls “integral philosophy” and he is a very powerful thinker. He has a quadrant model where the two axes of the quadrant are internal-external and individual-collective. Your individual internal life is basically your consciousness and your individual external life involves your observable behavior. On the collective level you have internal collective phenomena – culture, beliefs and values – and also external collective phenomena – the systems and actions we can observe. Wilber and his integral advocates suggest that any change effort in society should embrace all of four of those quadrants. Although like all models it is an oversimplification, it is a very powerful one and is built specifically to integrate and address what are often seen to be problematic polarities. Dynamic Facilitation, as I mentioned earlier, evokes polarities that then become conscious and serve the evolution of the group because of the transformed collective consciousness and conversation that result. Any kind of contribution is welcomed and validated and gets added into the puzzle. The persistent effort to understand and witness diverse perspectives and the continual invitation to be creative and contribute whatever you have to the discussion means that each person’s piece of the puzzle gets added in. Pretty soon everybody is looking at the whole puzzle and what to do about it. So there is an evocative dynamic here that uses polarized energies to produce forward motion. Dynamic Facilitation loves conflict and translating it into evolutionary power.